There are several ways to let users submit content in wordpress. You might have noticed in most of they blogs, they will have a submission form in sidebar or a separate page to let fella bloggers to submit posts. The post submission form consists of input fields like URL, Author Name, Tags, Post Title, Content, Category and image upload, that can be customized according to the requirements of the website. User submitted posts, news or links are saved in the form of drafts automatically and you have the option to publish them right then or once you have a particular number of posts that you approve. There are plenty of admin control choices for the posts and you have the option to filter all the posts in the dashboard conveniently. The drawback here is that it is only possible to display this plug-in through altering the theme design or template tag. It is possible to download this plug-in. FV Community News is an excellent pick for those who want their users to submit news related to your sector. This plug-in generates a form that allows users to submit a link, title, image and description. The content then moves into the admin panel for editing or moderation before you publish it. There is an option to alter field names and the default behaviour of the content submitted by the user and set the form through shortcode or widget. It also offers added options for creating an inventory of posts and a community content tag cloud. What is Quick Post Widget? Quick Post Widget works just as its name suggests. It offers a widget from that can be used by people to write a post and publish it fast. This also incorporates the alternative to toggle over to the visual editor that can be tailored to permit admins to endorse the posts before they come online. NB: The WordPress plug-in repository does not offer this plug-in and comparable functionality for images is only available through the Quick Post Image Widget. The Guest Post plugin in WordPress allows the user to include content into the site through a simple form available on the purpose-built page. To aid in weeding out span the form incorporates a Captcha. The content pasted go into the tab on the admin dashboard and it is possible to review them prior to posting. It is possible to download the newest version of the beta plugin. Gravity Forms are not available for free, but there are numerous users who have rated it as among the best contact forms here. It is not surprising that this is a wonderful option for including UGC on your website. It just requires setting up the form in a regular manner, but use of form field titles like title, tags, content, categories etc are from WordPress. There is a very useful tutorial for understanding the process of GravityWiz to make things simple for you. Incorporating a forum on the website is another alternative for including user generated content on the site. 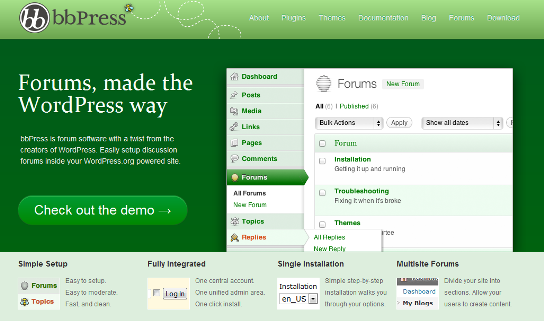 You will find a number of WordPress forum plugins, but some of the most popular are SimplePress and bbPress. There is a list available at WPMU.org for those who are looking for more choices. These two plugins incorporate almost all the functions expected from forums such as user registration, anti-spam tools, signatures, post moderation and more. You can see it in the feature list of the SimplePress. The best element of forums is they assist in developing an interactive community on the site and typically run themselves, even as you require a moderator. On the other hand don’t feel that you just have to select one of these techniques to include user generated content on the website. You have the option to incorporate a forum, get a few regular contributors and add a form on the sidebar or the page to allow other users to submit links and links. That is in fact having all you need. This is a good listing and review on user submitted content tools. I am thinking of implement one of those.